It's college graduation season, with young men and women all over the country receiving their degrees after four (or more) years of hard work. Many of them are lucky in that their commencement addresses are delivered by high profile, inspirational, and successful people (Lou Holtz spoke at my college graduation 11 years ago...man, I'm getting old). 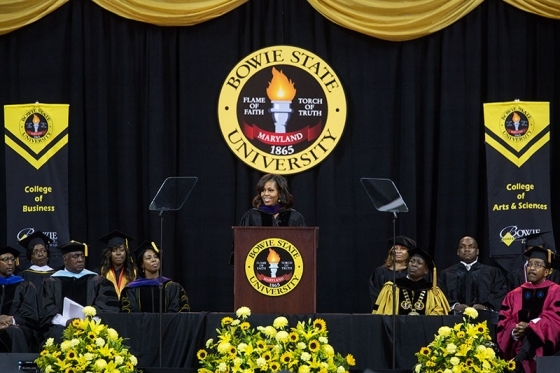 Of the news clips of graduation speeches I've seen so far this weekend, First Lady Michelle Obama's commencement address Friday at Bowie State University stands out the most. Both the First Lady and President Obama have to walk fine lines when talking about race. As the United States' first-ever African-American First Couple, when discussing the all-important-yet-sometimes-overly-sensitive topic of race, they run the risk of black people feeling they don't address race enough and white people thinking they talk about it too much. I'm generalizing here to make a point, but I think you understand what I'm saying. For generations, in many parts of this country, it was illegal for black people to get an education. Slaves caught reading or writing could be beaten to within an inch of their lives. Anyone -- black or white -- who dared to teach them could be fined or thrown into jail. And yet, just two years after the Emancipation Proclamation was signed, this school was founded not just to educate African Americans, but to teach them how to educate others... And since then, generations of students from all backgrounds have come to this school to be challenged, inspired and empowered. But today, more than 150 years after the Emancipation Proclamation, more than 50 years after the end of “separate but equal,” when it comes to getting an education, too many of our young people just can’t be bothered. Today, instead of walking miles every day to school, they’re sitting on couches for hours playing video games, watching TV. Instead of dreaming of being a teacher or a lawyer or a business leader, they’re fantasizing about being a baller or a rapper. Right now, one in three African American students are dropping out of high school. Only one in five African Americans between the ages of 25 and 29 has gotten a college degree -- one in five. But let’s be very clear. Today, getting an education is as important if not more important than it was back when this university was founded. Just look at the statistics. People who earn a bachelor’s degree or higher make nearly three times more money than high school dropouts, and they’re far less likely to be unemployed. Watch the video below of the First Lady's full commencement speech. I often hear (or read in the comments section of online articles) people questioning the need of HBCUs (historically black colleges and universities) today, or assertions that the continuation of black colleges is discriminatory or racist. This is an example of where healthy and honest discussions are needed. To answer that question simply, as the First Lady pointed out, Bowie State was founded in the mid-1800s when that was only the way blacks could get a higher education. So, after the Civil Rights Movement in the 1960s, were those universities, with their rich histories and traditions, supposed to close down since black students could finally attend college practically anywhere? (And don't forget, blacks continued to face resistance at many mainstream colleges on through the 1970s). Secondly, most HBCUs today, like Bowie State and Johnson C. Smith University in Charlotte (Civil Rights icon and former Congressman and U.S. Ambassador Andrew Young spoke at JCSU's commencement this morning), aggressively recruit students of all races. The reason they're referred to as HBCUs is because they're "historically black" (I didn't attend an HBCU, so I don't need to defend them other than to speak the truth). We can't deny history; let's embrace it and move forward. And focus on the alarming statistics the First Lady stated. By the way, Bowie State is a member of the CIAA, which holds its annual basketball tournament in Charlotte. Institutions of higher learning make up the CIAA, despite all the partying and debauchery the events surrounding the tournament have become known for. Who spoke at your college graduation? Was it memorable?